I haven't written an individual post on a restaurant for a long time now. Simply, because I think that most people are more interested in an overview of several places, rather than reading 10 posts about different places (Tell me if I am wrong, I am happy to change this). Also, it obviously takes up more time, which I don't always have. But this one here is worth it. Kitchen 151 deserves its own post - and here is why. First of all, I've spotted the place already during my first weekend here in Brussels in the beginning of November. As always, I start exploring the city by walking around, making a turn into little streets and discovering hidden places. So I had a look at their menu and it sounded very appealing, Middle eastern cuisine with an Ottolenghi-ish twist. The interior looked a lot like places that I normally like to go to; simple, yet nicely decorated - lightbulbs hanging from the ceiling, decorated with flowers, colorful water jugs and dried flowers - a wooden floor, simple wooden tables, pastel colors and that cosy feeling that you get when entering the place and sitting down. So one day I decided to make a reservation for me and a friend, but instead I found out that they offer cooking classes from time to time. 50€ for a three hour cooking class, a little wine tasting and more importantly surrounded by very good company. I didn't hesitate for too long, wrote to Simona & Tim, the couple to whom the restaurant belongs to and asked whether I could participate. I was lucky, there was two last spots left for the next day. Not knowing what to expect, except from the fact that the cooking class wouldn't be taking place at kitchen 151 but at Simona's and Tim's place, me and my friend rang the doorbell of a house that had a similar facade to other houses in Brussels - nothing special, but nice. Don't judge a book from its cover, is a very appropriate quote here. We walked through a tiny courtyard into a spacious, light and lovely loft, decorated in a simple but tasteful way. And there it was, my dream kitchen; open, spacious and inviting. We were the first ones arriving, so we had time to chit chat a bit with Tim & Simona about the art of food and other interesting things. The thing that comes to mind when seeing the two talk and interact is: #relationshipgoals. The way they talk about their goals and dreams - and food of course - seems like a great match. They are open, warm, super friendly and fun! The cooking class was a pure pleasure and I've learned many things about Middle Eastern ingredients and ways of preparation that I haven't know so far. We prepared baba ganoush, which is a paste made from Aubergines that you roast on a pan for an hour, with Tahina and pomegranate, roasted pumpkin, served with Labne, a thick kind of yoghurt, with scallions and red onions, shakshuka, which is tomatoes cooked in a pan until perfection with garlic, olive oil and eggs and we learned how to prepare za'atar and Tahina and also Malabi, a delicious dessert made from cream, milk and in that case rose water. So a delicious evening went to an end, with my belly being as happy as my liver. This was not the end, though; Simona invited me for brunch for the coming weekend and well, I cannot say no to food. So I went by myself, on a late Saturday morning, again not knowing what to expect. Let's put it like this: I should've chosen a pair of stretch pants rather than a tight skirt when dressing myself for brunch at kitchen 151. It was amazing. You pay 25€ and you get a glass of wine, coffee, water and I'd say between 4-7 "little" dishes. Believe me, it wasn't little at all. 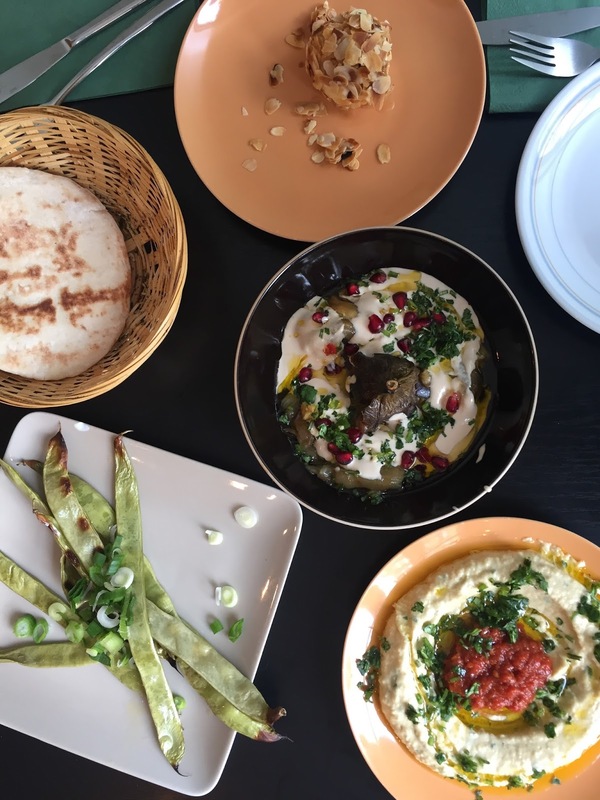 At first the friendly waiter brought me fresh, warm, fluffy pita with equally fresh, homemade hummus and a bowl of baba ganoush. This was followed by long green beans and mozzarella di bufala covered in roasted almonds and honey (God, so good!). I, and my stomach too, thought that that was it. No, no, forget it. I then got to try roasted beetroot with date syrup, olive oil and basil, a slice of roasted butternut squash with Labne and a kind of veggie stew à la maman de Simona - yum! A little piece of dessert and another coffee marked the finishing line of my little food marathon and it's not exaggerated if I say that I didn't walk, but roll out.